Commonly accepted misconceptions about tornadoes often lead people to make mistakes when preparing for tornadoes – so read up on these myths! False! Homes are damaged and destroyed by the extremely strong winds in a tornado, not pressure. If a tornado is approaching, you should seek shelter immediately. Taking the time to open all of your windows will put you in danger and will not protect your home from forceful winds. False! Tornadoes that form on land can cross bodies of water, including rivers and lakes. Tornadoes can also form on water. These tornadoes are called “waterspouts.” Never think that a body of water will protect you from a tornado. False! Tornadoes can strike any area at any time, regardless of past history. 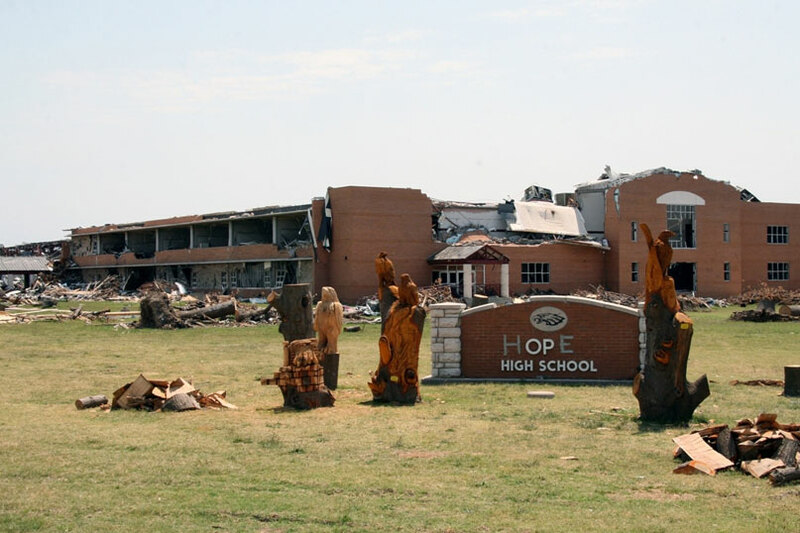 For instance, Cordell, Kansas was hit by tornadoes on the same day, May 20, three years in a row. Also, three different tornadoes hit the same church in Guy, Arkansas on the same day. False! Tornadoes are not more likely to hit a mobile home park, but the chances of them doing more damage and destruction to mobile homes are greater than to other structures. There are thousands of mobile homes located in tornado alley, and the damage seen in mobile home parks is significantly worse than what would occur in a neighborhood of frame homes. Even the weakest of tornadoes can flip and destroy a mobile home, when a frame home would receive little to no damage in the same storm. False! Not only do tornadoes not always have to appear as a visible funnel cloud, but they can also be hidden by heavy rainfall during the day or by darkness at night. False! While a highway overpass is a sturdy structure that may offer protection from flying debris, it will not protect you from dangerous winds. In fact, an overpass can act as a wind tunnel and may cause accelerated wind that collect debris, causing you more harm. If you are in your vehicle and a tornado is approaching, you should pull your vehicle to the side of the road immediately, get out, and lay flat in a nearby ditch covering your neck and head. False! While it was once widely believed that debris would not fall in the southwest corner of a structure that has now been rethought. The safest place to take shelter during a tornado is an interior room on the lowest floor of your home or building, as far as possible from exterior walls and windows. Even in a basement interior walls can provide additional protection from flying debris. False! Tornadoes do not follow a specific path or route, and can change directions at any time. The only safe place to be during a tornado is in a location that offers shelter from high winds and debris. False! Homes are damaged by the strong winds produced by a tornado, not by the changes in the air pressure. False! While downward-bulging clouds that show signs of a rotating motion can certainly mean a tornado is forming, not all downward-bulging clouds indicate a tornado. Some of these clouds are simply storm clouds and are completely harmless. False! Tornadoes can hit anywhere at any time. Several large cities have been hit by tornadoes throughout history, including Dallas, Miami, Minneapolis, Oklahoma City, Wichita Falls, Salt Lake City and St. Louis. False! Tornadoes can travel up and down hillsides, and are just as violent and dangerous. Living on a hill will not protect you from a tornado. False! A tornado can cause damage on the ground even when a visible funnel cloud has not formed. Also, if you see a funnel cloud that does not appear to be touching the ground, the wind and circulation may still reach the ground and cause extensive damage.